Cassava Culture, Don't Eat That Cassava! The cassava plant is now the world's third largest source of low cost carbohydrates especially for populations in the humid tropics, with Africa as its largest center of production. It originated in Brazil, and it is now brought to the world, especially to the African continent and all parts of Southeast Asia as well as many parts in the US. It is the principal source of nutrition for about 600 million people or even more around the world. 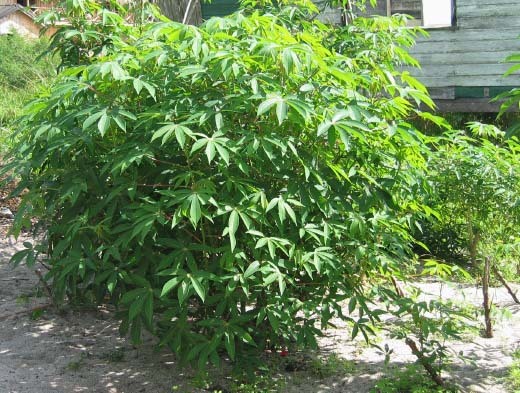 Cassava roots are very rich in starch, and contain significant amounts of protein, minerals, vitamins A, B and C.
Yes, we understood that cassava is an important edible plant, but you should know that it could be poisonous if not prepared correctly. It is the reason the Japanese Ministry of Health prohibits the use of cassava for human consumption. The toxin in cassava is called "linamarin". It is chemically similar to sugar but with a CN ion attached. When eaten raw, the human digestive system will convert this to cyanide poison. Just a few pieces of cassava roots contain a fatal dose of poison. We often see it not only on TV news programs but also on local tabloid papers, where school students were killed after eating cassava cake for their snacks. Many of those who prepared cassava cakes rushed to the nearby hospitals when they ate it. The reason of death was due to "cyanide poisoning". 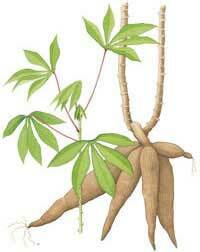 Cassava is traditionally boiled, or processed as an ingredient for native cakes in many tropical countries. Cassava is a staple food for many poor families. A popular delicacy among schoolchildren is deep-fried cassava coated with sugar. One hundred years ago, a group of Japanese immigrants went to Brazil for coffee planting, and in search of green pasture. That was the time when Japan was so poor and suffered from food shortage. However, when they arrived to Brazil, to their surprise, there were no support of foods and farmland that were promised by the Brazilian government. 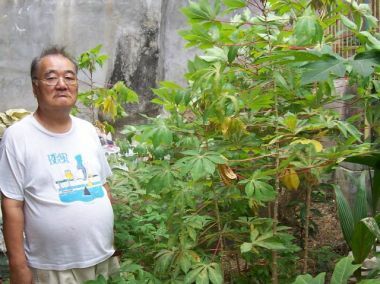 The Japanese immigrants planted cassava just to survive on the poor unfertile land. 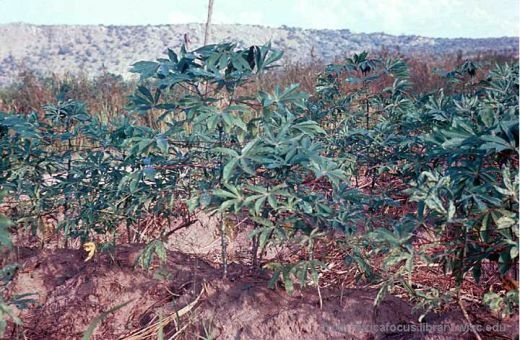 Cassava can grow easily on non-fertile lands. Many died due to hard life and cassava poisoning, and only a few immigrants survived with cassava as their main source of food. On our history record of Japanese immigrants to Brazil, only three Japanese survived up to the end of WWII. It was known that the bitter kinds of cassava are more poisonous than the sweet varieties. I believe the bitterness of cassava is caused by under-dried and infertile and gravel-conditioned land. Yes, it is an easy plant to grow in all land conditions as long as the climate does not go below 15 degrees Celsius, and it gives a good yield. It can be harvested after about one year to 18 months depending upon the fertile land conditions and climate. Water and fertilizer are important to have sweet cassava or less toxic crop. The young and fresh leaves may be cooked as vegetable with coconut milk. The tubers contain large amounts of starch, which is processed into flour. Cassava roots that are still attached to the stalk remain good for many months if stored under the ground. Once harvested, however, deterioration begins quickly. When the cassava root is converted from starch to sugar, a number of enzymatic reactions will take place, which causes discoloration of the product and reduces its nutrition value. Bacterial and fungal deterioration also occur. According to scientific studies, the bitter variety of cassava contains large amounts of the cyanogenic glycosides "linamarin" and "lotaustralin". Toxic elements are concentrated on its surface or peel. The toxic substances may affect the liver, kidney, and some parts of the brain when the poisons are accumulated in the body. 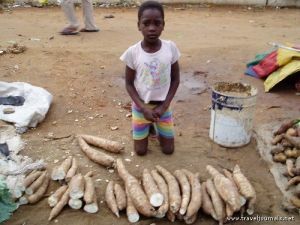 We suspect that the toxic substances in cassava may involve destroying the pituitary gland that causes liver and kidney damage. To avoid exposure to the toxin, sweet cassava should be prepared before eating. Peel and slice the cassava and then cook it thoroughly, either by baking, boiling or roasting. Grating the root and prolonged soaking of the gratings in water will leach out the cyanide, reducing the levels of toxin. The best way for human consumption is to extract starch by condensation method. Probably, cassava roots are best applied for animal feeds and industrial uses rather than for human consumption. However, I myself planted hundreds of cassava plants as fence plants surrounding my two acres of mountainside land in the Philippines. Everyday, the farm caretakers harvest a couple of cassava tubers for their snacks. How did I instruct them to eat it? You can grate it and add water. Squeeze the water to get white milk, and wait for the sedimentation of starch. The starch is mixed with powdered milk, egg or other rice powder or flour, sugar or honey. Now, you can bake or cook it as "hotcake" or "bread". If you prefer noodles, add salt instead of sugar or honey. In this way, detoxification of cassava is at least adequate according to laboratory tests. But we are not sure yet, because we might find new strain of toxic component in cassava, tomorrow. I feel that cassava poisoning may cause some brain damage related to the pituitary gland that causes other damage to various organs. No wonder the Japanese Ministry of Health prohibits the use of cassava as a food.